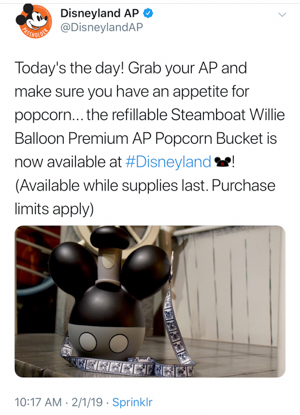 It was some time around January 28th that I saw that Disneyland was going to release a brand new Annual Passholder refillable popcorn bucket. 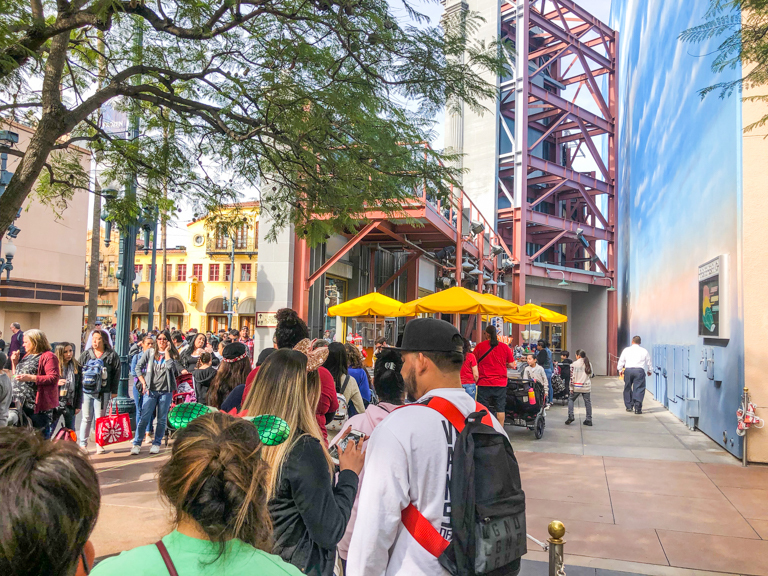 It was madness during the last Little Green Man AP popcorn bucket release, with people waiting 2 hours in line to buy one. Those buckets went on sale on a Tuesday and were sold out within 2 days. History has a way of repeating itself. This year, buckets went on sale on Friday, February 1st. I was already coming to Disneyland for another event going on later tonight, and I was working that Friday but thankfully was able to get off work just a little early to make it over to the park. When I got to the park, I headed straight for California Adventure. 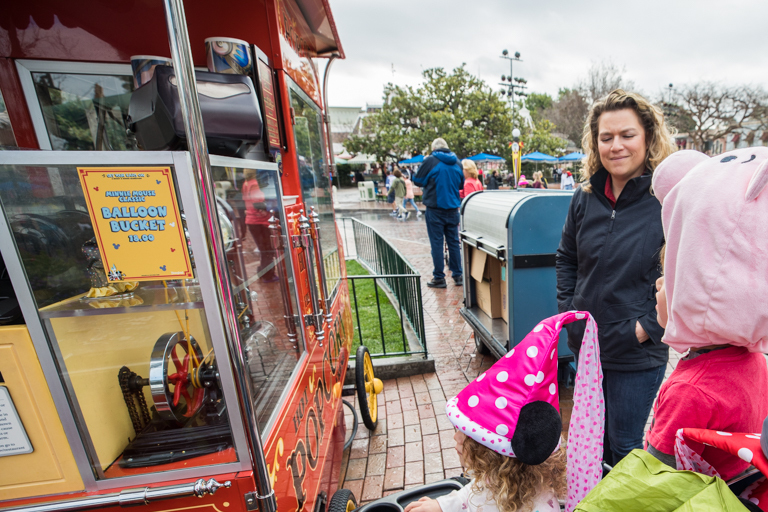 I don't know why, since there's very few popcorn stands at DCA (only 4) compared to Disneyland (with 8). 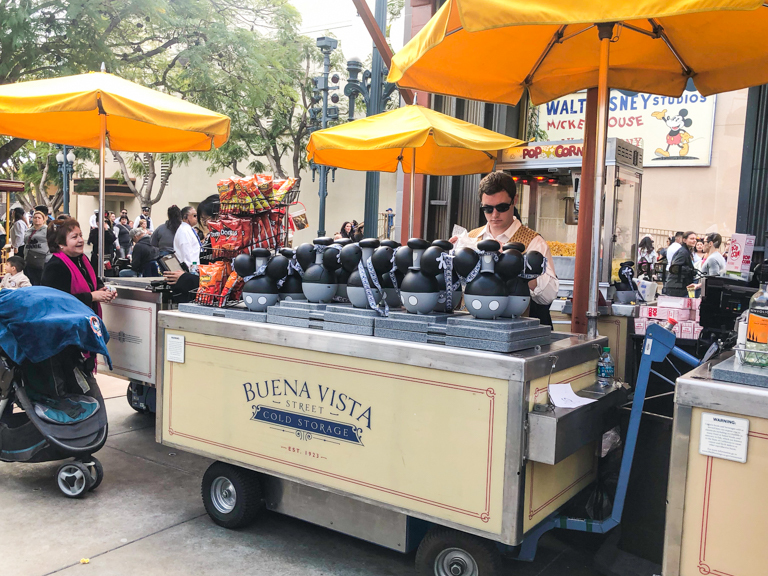 My first stop was the Buena Vista Street popcorn stand, but lines there stretched for a ways, plus there was a cast member at the end of the line warning people "the only popcorn buckets left are what you see. There are no more in the back. You might not get one in this line. 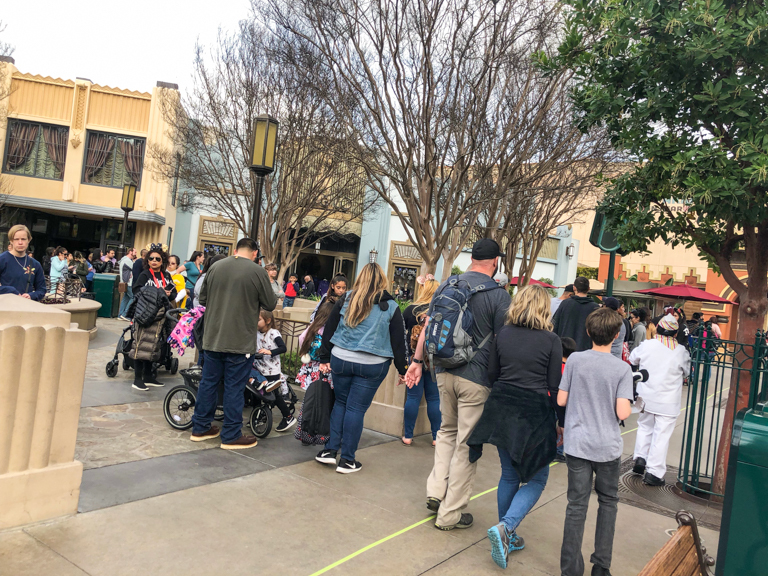 Go over to the Hyperion Theater where there are shorter lines and more buckets." This was at 1:30pm. Yikes! Over at the Hyperion Theater there's long tape lines on the ground and lots of people already in line. At least it's organized. At 1:35pm I was at the back of the line, slowly moving my way forward, keeping a watchful eye on the supply of buckets going out. Nearly 40 minutes later and I'm getting close to the front. Only 10 or so people in front of me now. There's a sign you don't want to see. 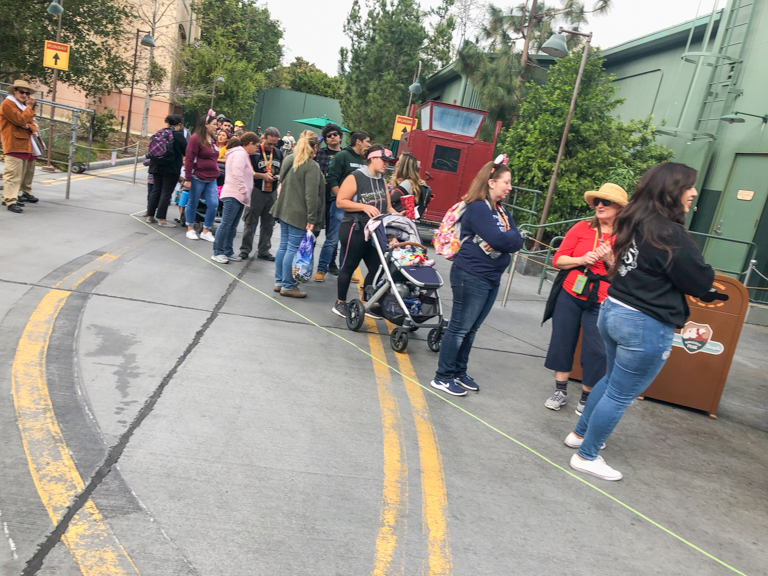 A cast member started counting the number of people in line and made an announcement that "There are about 100 buckets remaining. Everyone in this line right now should be able to get one." Glad I'm so close to the front. Finally, after 45 minutes in line I walked up to the cast member, presented my AP, and got my Mickey bucket. With a little time to kill before my event begins tonight, I can walk the parks and see what's going on everywhere else. 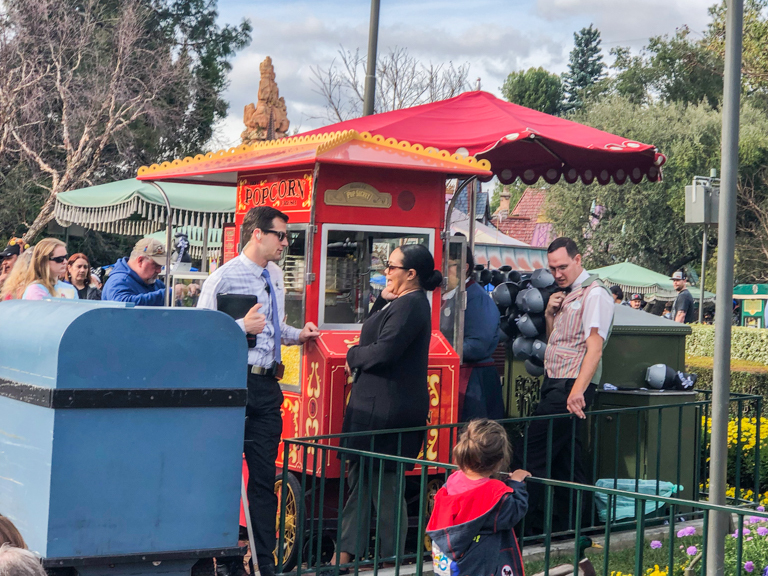 Back at the Buena Vista Street popcorn stand people are still stretched over to Elias and Co. Guess they didn't run out of buckets here after all. 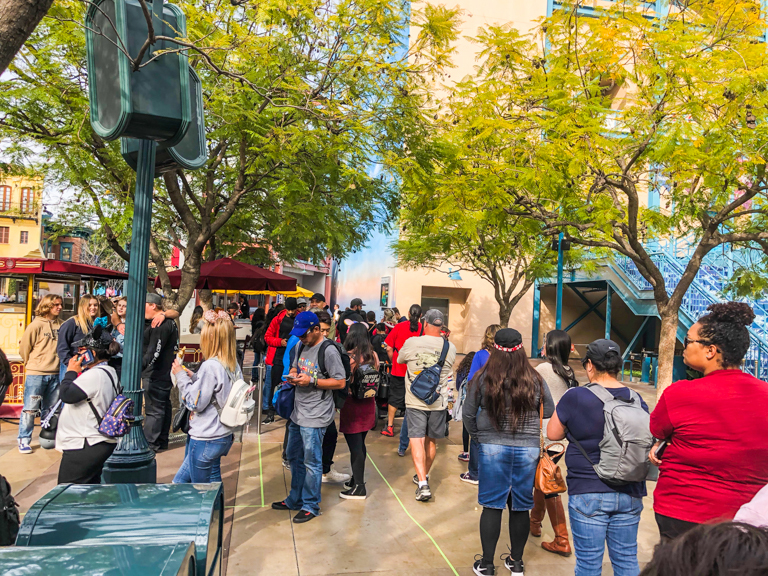 By Soarin, there is another popcorn stand, this time with lines stretching almost backstage. And at the back of the park near Toy Story there's one more popcorn stand. 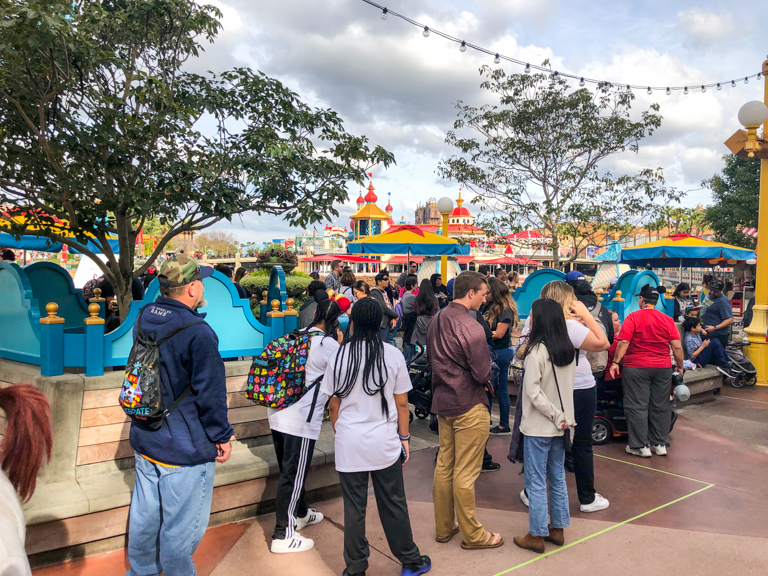 And once again, lines stretch out in what will surely be almost an hour's wait. Let's jump parks over to Disneyland. At Disneyland the lines at the front of the park were long, but there looks to be plenty of buckets for the time being. 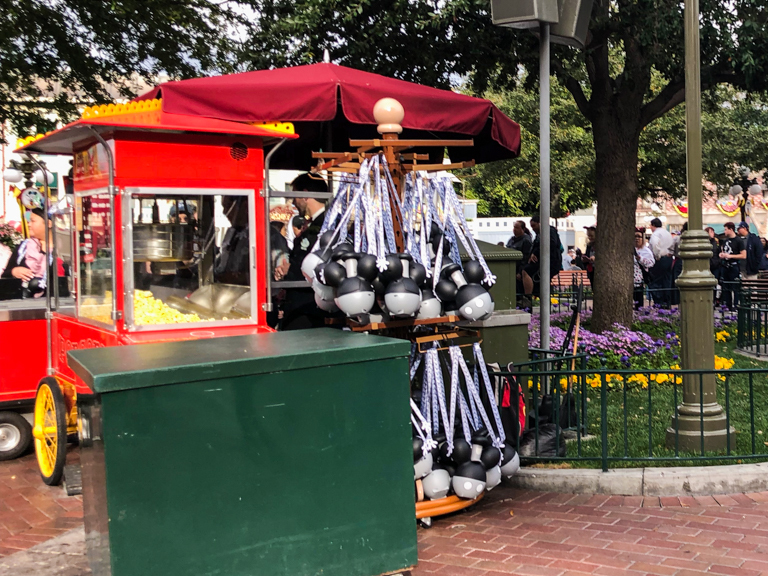 And at the popcorn stand right at the hub when I walked by at 4pm there were only 5 people in line and a whole rack full of extra buckets. Is the hype over for these buckets? Nope! 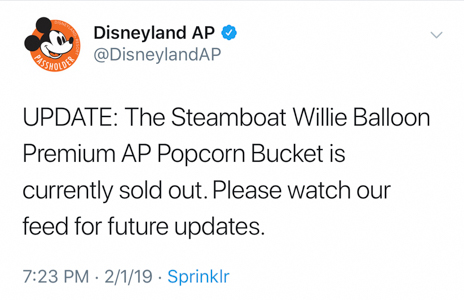 Only 10 hours after the parks opened this morning, they've sold out of all the Steamboat Willie buckets. I saw a photo showing a case of 24 buckets per case and 1462 cases. Doing the math, that means there were a possible 35,088 buckets out there today. Taking the math just a little bit further, if all 12 popcorn stands were open at 9am, they were open for about 623 minutes. If you assume the buckets were evenly split between all 12 stands, each stand sold 2924 buckets in that time period, or 4.7 buckets every minute. Thats... a bit unbelievable. At $20 a piece, Disney pulled in $700k (assuming they sold them all). I did hear there were quality control issues and a few buckets had to be scrapped. On Feb 10th, I was back at Disneyland with the family. This time with a proper hat. 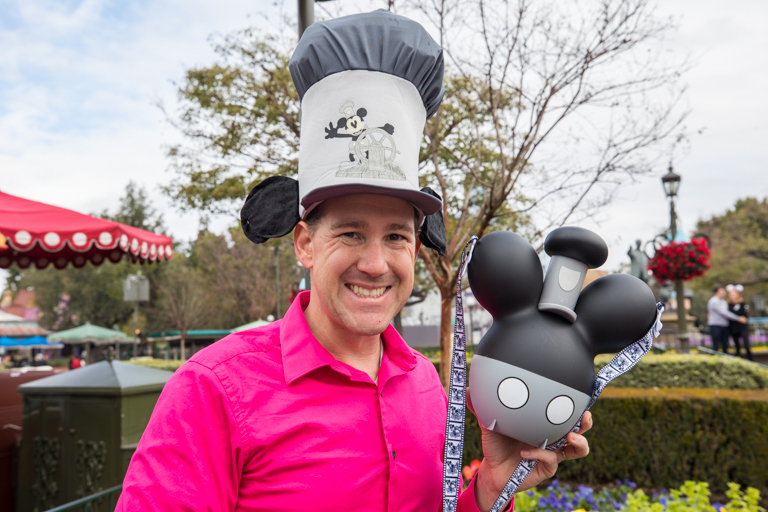 For someone who collects Disney hats, I of course need to get a photo with my Steamboat Willie hat and popcorn bucket. 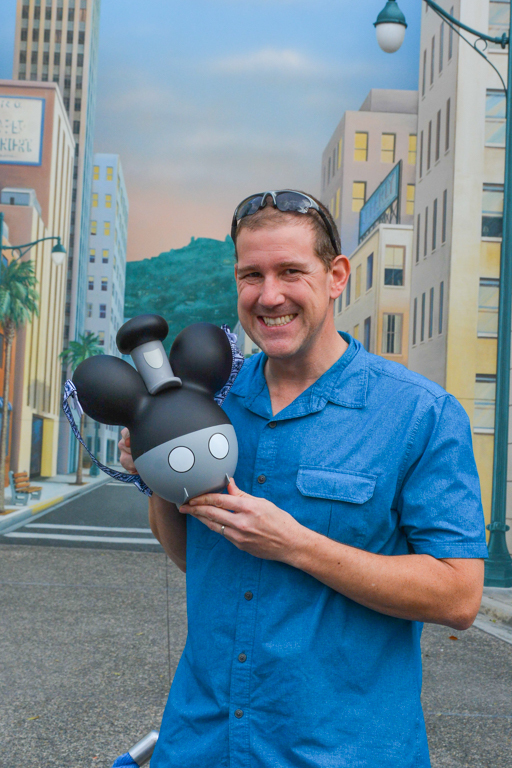 From what I can tell, the Steamboat Willie hat came from Florida back in the 90s. Let's get some popcorn kids! 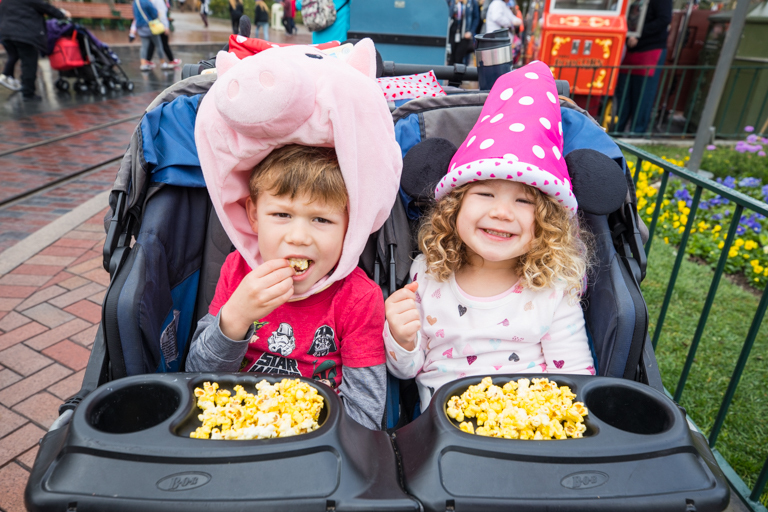 They are certainly popcorn fanatics. When I told Ian this morning that popcorn refills were $1, he went into his back and grabbed 4 quarters, putting them in his pocket for later. Here's a look at the back side of the bucket. I love the matte finish instead of the shiny finish. One problem with the matte finish though is that when it gets greasy it's really difficult to clean off. 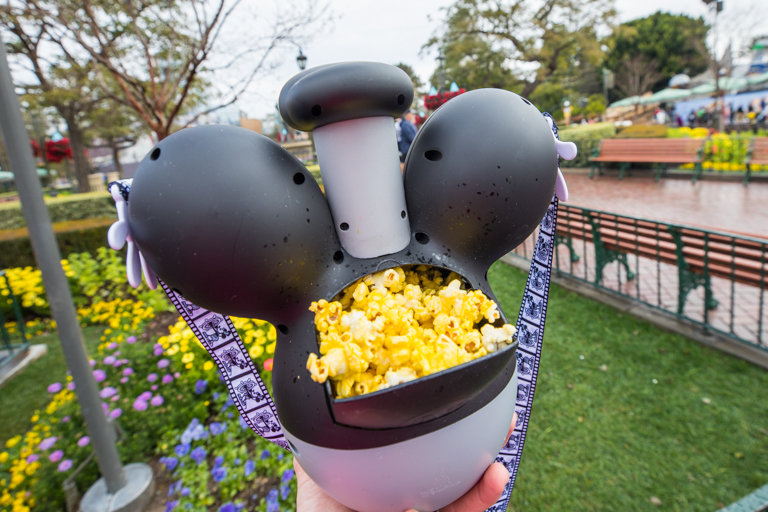 In all my previous experiences getting popcorn refills, cast members were okay providing a paper bucket instead of using the plastic bucket. Not the cast member at the hub on Sunday morning though. She insisted on using the bucket. And here's the ones I do it all for. The kids devoured popcorn all day and we must have had 5 refills today. We're certainly going to get our money's worth of popcorn refills. 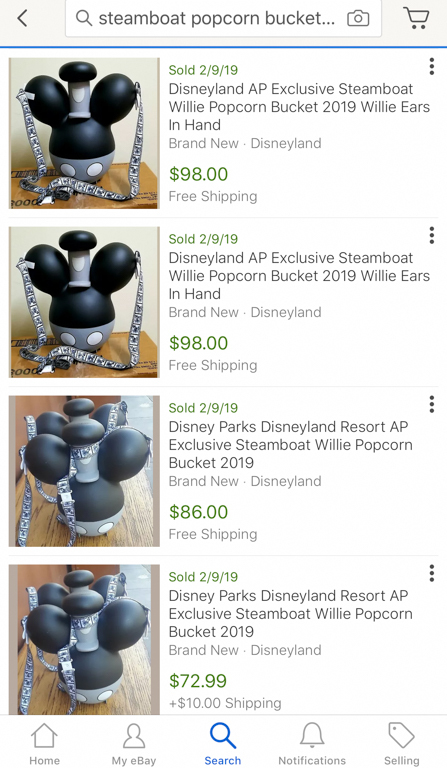 And speaking of money's worth, those $20 buckets are fetching quite the pretty penny over on eBay. 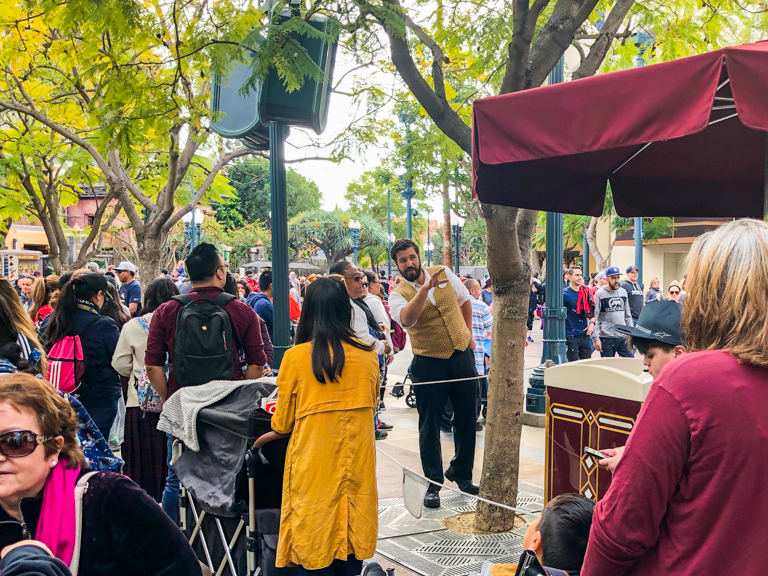 No wonder people are waiting in long lines and Disneyland is selling out so quickly. Not us though! These $1 refills are too valuable! I saw that. Tokyo certainly owns the market when it comes to cute popcorn buckets. Disneyland has had a few cute releases, mostly coinciding with holidays, but they're still a bit lacking. There certainly appears to be a market for it here though. I was happy every time I saw a CM wheeling more buckets to the popcorn stand. Just 3 more weeks to get popcorn refills until it's all over!